Guide fee, demo beacons, shovel, avalanche probe, single-ride lift ticket, all course materials. Transportation to/from the course area, personal food, and personal ski equipment. Feeling a bit rusty on some of the skills acquired during your Level 1 avalanche course. 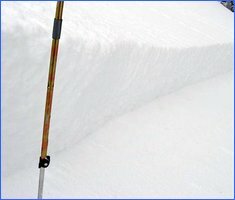 Our AIARE Level 1 Avalanche Refresher Course provides an opportunity for past AIARE Level 1 course participants to review their skills and to be exposed to new information and techniques that may have been introduced since completion of of your last avalanche course. Join the planning session of an existing AIARE Level 1 program and then take part in the final touring day of the program. We begin with an indoor review of the basics and then spend a full day outdoors applying those skills. While the basic structure of each Avalanche Refresher Course is the same, we use a portion of the day to cover new beacons, technology, or techniques to provide participants with an update of their avalanche education. Depending on snow conditions, these programs take place either near Stevens Pass Ski Area or in Icicle Creek Canyon near Leavenworth, WA. On custom courses or with small groups, the itinerary can be customized to concentrate on skills that you select. If you would like to do this in one day it must be organized as a custom course. 3:00 pm - 6:00 PM: Attend planning session of regular AIARE L1 Course.